If you think equestrian sport psychology is just about relaxation and deep breathing and visualization, THINK AGAIN. Sport psychology is a lot more than just relaxation exercises, visualization, and positive thinking. Unfortunately, that’s all most people ever hear about, so when those strategies don’t work they feel stuck, with nowhere else to go. 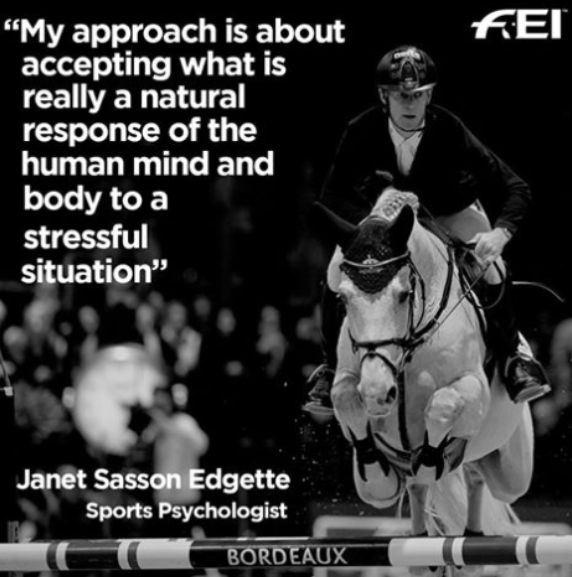 My sport psychology approach differs from conventional sport psychology models, and has proved to be much more effective in helping riders manage the performance anxiety they experience at shows, clinics, or when riding other people’s horses. Instead of investing a lot of energy in trying to get rid of thoughts or feelings you don’t like, you learn how to ride well in spite of them. That way you’re not always looking over your shoulder to see if your nerves are catching up with you, and you don’t have to pretend to think or feel a certain way that you may not be thinking or feeling. By taking the “fight” out of anxiety management or your real fears of getting injured, and remaining very authentic and true to your real experience, you will be disempowering the anxiety you feel and empowering your own self. From there, it’s easy to figure out how to compensate for the ways in which anxiety affects your riding. So, for example, if show nerves turn you into a passive, “second-guess-every-decision” kind of rider, then our job together will be discovering the best ways for you to quickly access and mobilize your more assertive, confident side. If show nerves turn your legs into a vice grip and your hands into steel, then our job becomes one of figuring out the thoughts or images that bring flexibility and softness into your body. These are things you can control. Making yourself “relax”—not so much. Besides, who do you know who’s really relaxed at horse shows? The only ones I’ve ever known were the ones who got there by “accident”—they either were thrown into the ring on a strange horse at the last second or were riding under other unforeseen circumstances that made their expectations (and everyone else’s), well, soft. For the rest of us, once the outcome matters, everything changes, including and especially our anxiety levels. That’s just human nature. The funny thing about show nerves is that they’re only a problem if you think you shouldn’t be having them. 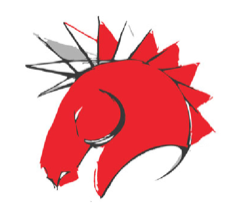 Equestrian sport psychology is for any rider who wants to be able to ride or perform at their best under conditions where they are feeling anxious or distracted, or have some type fear, such as that of getting hurt. Sport psychology is also helpful to riders who worry about making mistakes or ruining their new horse or someone else’s horse they’ve been asked to ride. Riders have used my services to help them deal with the stress of training and showing, and even its impact on their family members or partners/spouses; many have wanted to talk about their relationships with their trainers, and find out how best to address issues that have come up in the course of working together. I’ve met with riders who were so upset after losing a favorite horse that they had trouble partnering with their new one, as well as with kids who were having trouble managing their frustration when not performing as well as they’d hoped. I meet with amateurs, juniors, parents, instructors, trainers, recreational riders, and professionals riding up through World Cup and Olympic levels, and invite you to contact me with any questions you might have about how sport psychology can help you..
My way of working with riders is well-suited to phone or online consultation, since I don’t use conventional strategies such as relaxation, imagery, visualization, etc. which would require more of an in-person presence. Instead, I build conversations that help clients shift perspectives, embrace challenges as manageable even if un-welcomed, and/or learn to compensate for the ways in which their performance anxiety or fears compromise their riding. Read the FEI Interview HERE or click the above image. My sport psychology approach differs from conventional sport psychology models, and has proved to be much more effective in helping riders manage the performance anxiety they experience at shows, clinics, or when riding other people’s horses. Instead of investing a lot of energy in trying to get rid of thoughts or feelings you don’t like, you learn how to ride well in spite of them. That way you’re not always looking over your shoulder to see if your nerves are catching up with you, and you don’t have to pretend to think or feel a certain way that you may not be thinking or feeling.